This week we celebrate Little Lady's birthday. See three little fingers popping up. And she enjoys: sitting on the special birthday chair, wearing a birthday crown, a lot of little extra privileges and of course, treats for the class! How delighted she was, carrying this big biscuit box, filled with chocolate muffins -oh so carefully- to school. My mummy heart filled with a warm glow... Our baby girl turns into a beautiful little lady, but way to fast. Melt together the butter and chopped dark chocolate. Whisk together the eggs and powdered sugar until it foams. Stir the chocolate and the flour in this mixture. Make sure the batter is smooth and the chocolate is evenly incorporated. Fill muffin tins and bake for about 10 to 15 minutes. 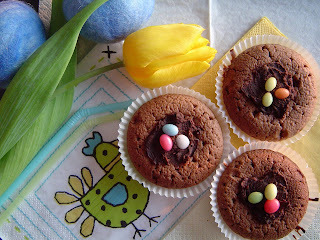 These are decorated with some candy eggs in a chocolate nest. Kwam op je blog via Flickr. 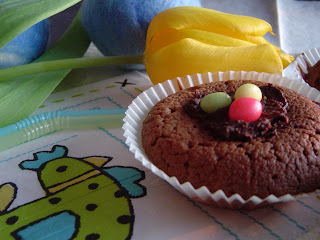 Waar is de tijd dat mijn moeder een biscuit bakte voor Pasen? Je nestjes zien er lekker uit. Oh these are so sweet!! Can there ever be too much chocolate?